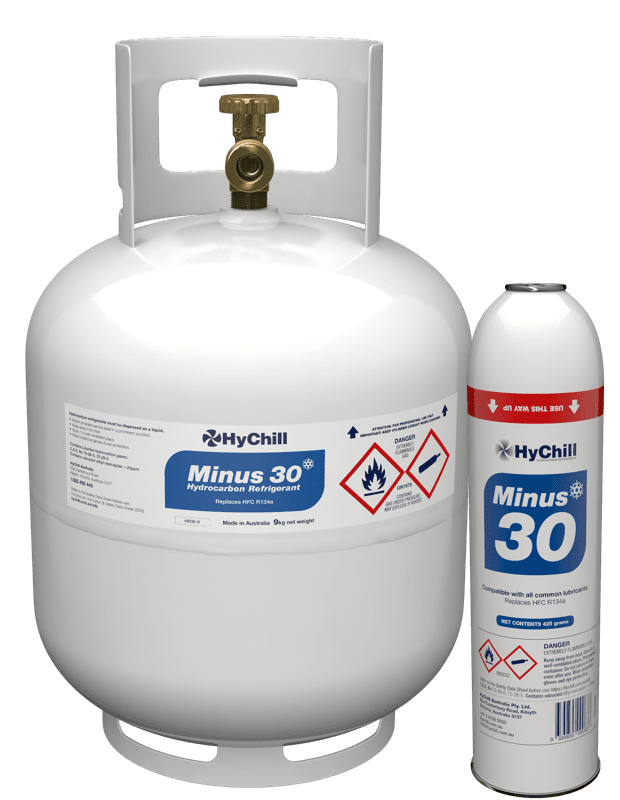 Minus 30 is a blend of R600a and R290, two naturally occurring hydrocarbon refrigerant gases and is perfect for use in automotive air-conditioning systems and in refrigeration applications. Ideal for use in small commercial refrigeration and air-conditioning systems where R12 has traditionally been used. Packed in a cardboard box with information kit containing refrigerant identification labels, material safety data sheet and other usage guidance information. 30% by weight required of recommended fluorocarbon refrigerant charge or refer to charge weight section. Digital scales recommended – they save a great deal of time and also help to prevent refrigerant wastage. No upgrading to existing processing equipment required. 4.5kg, 9kg cylinders and 450g cans.